Search today's newest 60 E Monroe Chicago Loop condos for sale and real estate listings in Chicago. The Legacy is a condo building located in Chicago, Illinois that offers a wide variety of amenities to fit any lifestyle. Search 60 E Monroe condos for sale & real estate in 60 E Monroe below. Browse our Chicago condos, lofts, Chicago penthouses and Chicago highrise condos for sale by location, size or price and let this website be your local real estate guide. We would love to be your Chicago real estate agents and assist in the condo buying process. To request more information about 60 E Monroe properties for sale or to schedule a private condo showing, contact your Chicago Loop real estate experts today. Read more about 60 E Monroe real estate. Looking to buy or sell a condo at 60 E Monroe? Call Guarnero Group Compass, your Chicago Loop real estate team, at 312-810-6693. We are 60 E Monroe real estate agents and experts on the Chicago Loop condominium market. Located at 60 E Monroe, The Legacy is the latest development to hit Chicago's Loop neighborhood. 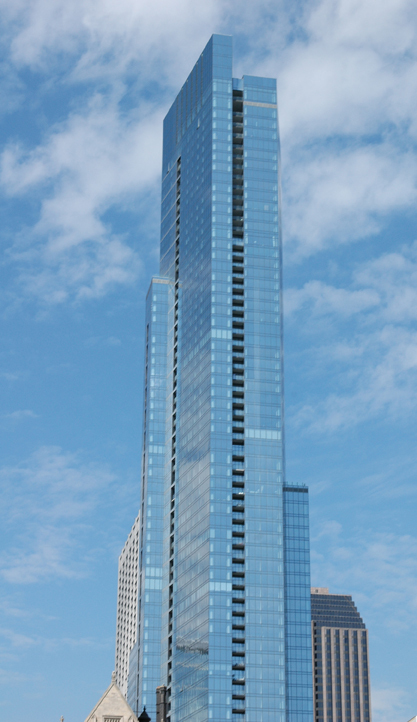 The Legacy is one of the most attractive and singular skyscrapers in all of Chicago. Soaring 73 stories high, The Legacy in Chicago stands prominently amongst the many shorter, squatter buildings that surround it. Tall and sleek, The Legacy's fine craftsmanship is showcased in its exquisite glass facade. Uniquely, The Legacy's design is one which is wide and narrow, a point of departure from the more evenly proportioned high-rises that define the norm. Because of The Legacy's distinct shape, each of its 355 units are afforded good views of Lake Michigan and Grant Park. 60 E Monroe condos for sale in Chicago are fully appointed and boast the finest of finishes, thereby ensuring a luxurious living space. Large windows that provide stunning panoramic lake, park and city views are a premier feature. Other luxury amenities include three expansive sun-decks, two gorgeous party rooms, five squash courts and an indoor pool, Jacuzzi and steam room. Significantly, residents also have the privilege of access to and use of the University Club, one of Chicago's premier and historical private clubs. Additionally, The Legacy is also home to a dog-run for the convenience of pet owners and the enjoyment of their pups. Located in the heart of the Loop, The Legacy is a stone's throw from many of Chicago's most popular destinations and attractions. Just across the street from Millennium and Grant parks, residents can laze the day away under the sun, enjoy any one of the countless concerts, festivals and various events that these parks are host to in the warmer months, admire artwork, sip a hot chocolate and even ice skate in the winter. Lake Michigan is just a five-minute walk away, so residents can easily enjoy a lakeshore jog or bike ride. Chicago's Museum Campus, as well as the Symphony and Opera are all less than ten minutes away which makes cultural excursions as simple as could be. Michigan Avenue and the first-rate department stores and boutiques that line it are minutes from The Legacy's front door. Plenty of public transportation can be found on the surrounding streets, but residents will delight in their short commute to work. Buying or selling a condo in 60 E Monroe? Let our team of Chicago Loop real estate agents help you through the purchase of your new 60 E Monroe property or your current 60 E Monroe condo. As local The Legacy real estate agents and real estate agents, we have expert insider knowledge of the market dynamics unique to the Chicago IL real estate market. We're here to work with you today! Contact Guarnero Group Compass to get more information about buyer or seller representation in 60 E Monroe. Planning to get involved in the Chicago Loop real estate market? Review our CMA (comparative market analysis) form to quickly see your The Legacy property evaluation within minutes.